I’m in love with this one. I wanted to combine my abstract aesthetic with my floral style and see what happened...and it looks like this! I love the colors with the line work and minimalist approach. I envision this painting in a casual boho style home full of chic natural elements. Click this link for more details on this beautiful abstract floral painting. Hi! I’m so productive lately as I paint an array of abstract floral pieces. I’m loving working with bright color and it really brings my soul to life. I’ve worked so hard to produce floral paintings that are distinctly my own style and recognizable as mine. I’m proud of that! Click here for the Original Abstract Floral Painting. Click here for the Abstract Floral Art Print. I’m loving working in blush tones lately. I have a lot of work coming soon (in all sizes!) featuring these colors. They are perfect in minimalist or boho-style spaces…so calming, soothing and the perfect chic statement to pull your space together. One technique I use when I am super-frustrated or annoyed about something is to push my breath out as hard as possible for as long as I can (like blowing out a candle…but on steroids). Then, I take a breath in VERY slowly and count to 7 while I think “In with love.” Next, I breathe OUT slowly with another count to 7 or more until ALLLLLL the air is gone and then some. With that, I think “Out with hate” (I will say it a few times as I breathe out.) I do this over and over until I feel so calm and relaxed. It sounds cheesy, but it actually works and I do it all the time. It’s also the method I use when I’m having trouble falling asleep. The slow breathing really forces my heart to steady and keeps my brain from racing. It forces your physical body to slow down and the next thing you know, you are waking up from a sound sleep! Anyway, don’t let negative energy get stuck inside! Send it out frequently so it doesn’t build up and cause dis-ease (and disease!). Be sure to click and save the image if you’d like to share it on Instagram or Facebook! As an artist, it is easy to assume that one day the “right” person will find our work and then share it with the world and suddenly we will be famous and successful. It’s a dream, right? It’s also not reality. Artists who are successful figure out who they want to reach with their art and then they GO FIND THEM. They reach out via email, direct message, comment, or tweet. They find where the right opportunities are and then go after them. There’s no magic in it. Just hard work and effort and bravery. Artists build door after door as they build their careers and it takes commitment and drive and the awareness of who their work IS for and who it ISN’T. With this knowledge, we get out into the world and build relationships…a network of people we can help and who may be able to help us one day. It takes time. You can still paint all day long and keep it a secret. Then, it is a wonderful hobby. But the professional artist who wants to make a career in selling paintings will get out there and create their opportunities. How to Reach Your Goals and Increase Your Productivity! For YEARS I have had so many different goals and resolutions…de-clutter the house, start a regular exercise routine, regularly update my business book keeping…I never seem to stick with a schedule and I recently gave it some real thought. Why do I find it so challenging to do these things? The answer came to me when I thought about my feelings and I realize that I dread these tasks because they seem overwhelming. Insurmountable. Too time-consuming. Too much work. BLAAAHHHHH. The results from these limiting beliefs was NO ACTION. No productivity. No changes. Well, what could I do to make the tasks less overwhelming? Less time-consuming? Today do-able? When I want to declutter a room, I start with ONE drawer and set the timer to 20 minutes. I then go ahead and do what I can within that 20 minute window. Once the time is up, I can stop! This allows me to feel like I’m moving toward my goals without all the feelings of overwhelm and struggle. If I have not completed the drawer and I have more time, then perhaps I set the timer for 10 more minutes and finish up. OR, I simply leave it to the next day. Over the following days, weeks, and months I move through the room drawer-by-drawer and cabinet-by-cabinet using the timer to help me stay on task. It’s much easier to reach our goals when we have a flexible deadline. With exercise, I am a beginner and have quit trying several times. Usually it’s because I do too much too fast and it becomes very punishing, painful, and a horrible experience. Now, I’m setting my timer to 10 minutes and doing high-intensity circuit training in that window. I figure that 40 minutes seems like torture, but I can handle 10 minutes of anything! AND starting out with small goals allows me to build up my strength over time as I am actually able to show up a little bit each day. 10 minutes is better than ZERO minutes (which is what I was doing before!). Before too long, I will build up to 15 minute windows and then 20 minute windows and so-forth. Another great use is with helping the kids be productive in chores or with food. My kids struggle to eat their meals in a timely manner. They would sit for 3 hours if I let them (and still never eat much food!). Cue the timer! I simply set the timer for 30 minutes and set it nearby where they can watch it. There is NO annoying or stressful ticking noise to add stress. It simply shows the allotment of time available in an easy way. The kids can now see and control their use of their time because the timer makes it clear how much of it is left. The result? Food is eaten and there is more time for homework, fun activities, chores, and other tasks for the evening. It’s ok to have lots of goals, but we need to have a way to make them attainable. We need to set ourselves up for realistic success. Breaking my goals down into small chunks and using the timer to keep me on task has been a huge help for my productivity. No more feelings of dread or overwhelm and I feel like I can attain ANYTHING (as long as I give myself enough TIME to make it happen in a real way!). Snag your own Time Timer here! Study by Megan Carty, Copyright 2019 by the artist. It is illegal to take and use this image. My newest abstract art collection I’m working on all started with this little study in my sketchbook. I’m in looooooove with the bright pops of color and the simplicity of the composition. I purposely restrained my use of colors so that the piece would make more of a statement in a room. The colors have enough breathing room to really sing, stand out, and be bold. I’m doing a TON of new work like this...both on paper and on canvas. AND I’ve got LARGE pieces coming…perfect for a mantle or over a couch or in a dining room. BOOM!!! Images I discover on Pinterest often inspire the color combinations I choose for my work; I wanted to share what this looks like to give you a peek into my process. Follow me on Pinterest here. The original image is from the Denmark based House-Doctor. The bright lemon yellow color of that little box there halted me in my scroll and all the different shades of green around it got my wheels turning! I am producing several abstract paintings with these different variations and I’m doubtful I’ll be tired of it anytime soon! In January, I like to reflect on the past year and think about what I’ve learned (both positive and negative) and how I can take that with me. When bad things happen, they happen FOR us (not TO us). Hard things are painful because they force us to stretch and expand and thus move us toward the next great thing. We are always expanding and changing (and not just from the holiday treats!) It’s part of our purpose here. We can’t live in the past. Once we have stretched and learned, it’s over and gone forever. We get to choose how we feel as we move ahead. It doesn’t always seem that way, does it? We hang on to our burdens like a badge of honor when they don’t serve us in a positive way. I give myself permission to let go of old burdens and keep my eyes forward. Always searching for gratitude and ways to make things great right NOW. I hope you will too! 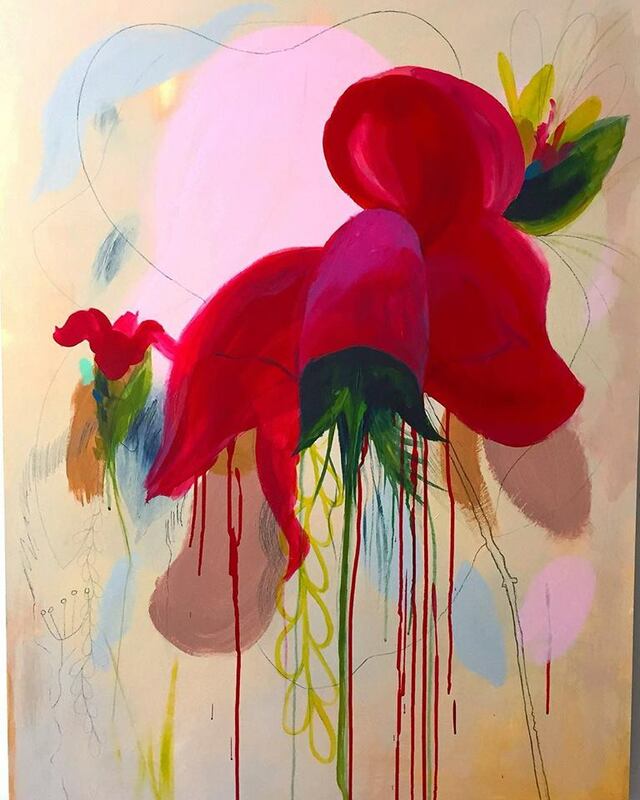 Artist's Edit: Style this Abstract Floral Painting! I realized recently that sharing my artwork with you is great, but showing HOW it can work in your space is even better! Each month I will post as part of a new series I’ve created called “Artist’s Edit” where I take one of my paintings and style it for an imaginary space using furniture and accessories I think would go well with it. If you like it, I hope you’ll consider pinning it to your Pinterest boards! First up: this featured art piece is one of my favorite modern abstract floral paintings called “I Forgot to Weed” and it comes FRAMED in an awesome golden floater frame. I think it’s the perfect complement to a den or office; much (but not ALL) of the furniture and accessories I suggest here are by Article. I’m so excited to share that I’ve create a whole collection of floral slides for I-Slide! I got to go into their headquarters for a bit and paint a pair of slides and discuss what my work means to me and how I want to impact others. And THEN I got to design a collection of slides with my artwork! What a wonderful experience, thank you so much I-Slide!!! (I love how these bring a much needed feminine touch to their assortment! Yay!) Go HERE to shop the collection! They won’t be available forever, so grab your pair now! Watch and listen below as I talk about my battle with depression and how my artwork helps get the word out about mental health awareness. New Floral Art Prints Added! I’m excited to have added a whole bunch of new floral fine art prints in the shop! I’m offering them in a wide array of styles and sizes. Simply click on the one you like and choose the size from the drop-down menu. That will update the price so you can decide which one you want most. These are such high quality printed with fade-proof inks that last more than a lifetime on quality flat canvas…simple frame them up and they look like the real thing! The crippling tangles of anxiety and depression come in waves out of nowhere and try to take root. It can feel like extreme overwhelm and emptiness all at once. But you are also still in there...the beauty, the memories, the love and sweetness of life...but it can quickly get overgrown and crowded and strangled without treatment. Tend to your garden every day. My latest work is abstract but has a message. I’m exploring what it feels like inside my brain while living and coping with depression and anxiety. How it isn’t always just black and bleak. It is complicated and full of color, confusion, decay, growth, and beauty. There is optimism, light, and energy. There is fear, desperation and stress. There is dismay, chatter, loneliness and overwhelm and it all exists together in a sort of murky soup. (for lack of a better word). I create a tangle of color, shape and line to convey this confusion of life and decay to the viewer in a relatable way. Surprisingly, the end result is something I hope to be pretty and interesting to look at. To be relatable and delightful despite having a morbid undercurrent. Like it has a hidden secret there in plain view…a secret shared between artist and viewer. What we see on the surface isn’t always the end of the story; it’s just the very beginning. My art practice has required me to decide what I want to do with my time each day. How do I want to spend and experience my energy? There is something to be said for working slowly and deliberately on something that is high-quality and meaningful. This means there isn’t a ton of work made attainable for anyone and everyone like fast fashion. It means I am allowing for precious time with my children. Time to take a walk and watch the leaves dance on their branches. Time to live this one life and NOTICE it while it’s happening. It’s taken me years to understand and embrace this. Making abstract work used to be very intimidating. Back when it mattered to me that people thought I had “good art skills” I wanted them to think “Wow, THAT looks just like a tree!” (you know what I mean) I didn’t want anyone to say things like “My 2 year old could make that!” or “UGH, THAT’S not art!! !” It’s not easy to share and show the deepest thoughts and feelings I have when I am painting a sunny beach scene. I appreciate and am proud of the landscapes I’ve made and often-times I have the urge to make them just for the sheer pleasure of it. There is a place for that! Connecting to others using emotional concepts has required a vulnerability and bravery to make work that isn’t so recognizable right away. It has taken a real sense of personal mission and self belief to make this new work…I’ve had to overcome a lot of stomach aches and headaches! I doubt I will ever get used to the feeling of sticking my neck out on a chopping block that is each new piece. But the sense of personal fulfillment keeps me coming back again and I have to suppose I’m on the right track. Back in art school I once had a professor physically tear up a project of mine into little pieces in front of the whole class. It was a humiliating experience that I let thread itself into the fabric of my being. I felt like I wasn’t worthy of expressing MY ideas. That what I had to say wasn’t important. I felt singled out under a spotlight with a big sign that said LOSER and IMPOSTER. 22 years and a lot of growth after that toxic experience I’ve come to realize that we don’t have to hold on to the things that have happened to us. The energy during that critique was HIS energy, NOT MINE. I don’t have to hang onto the experience like some sort of trophy out to poison me. I gave that energy back. The same is true for all the negative and traumatic happenings in my life…they happened and I learned valuable things from them. And they are safely in the past. Inner peace comes from living in the NOW and embracing who we are HERE in this second. I can choose to LET GO the happenings that aren’t currently serving me and it has made all the difference in my mindset, beliefs, and overall well-being. I urge you to think about the things from your past you might be clinging to with resentment and anger and consider severing ties with that poison that holds you back from being who you are meant to be. I just completed my newest abstract floral painting and titled it "Here, Not Here." I consider this a self-portrait of my brain/personality coping with depression and anxiety. It's not all blackness and despair! I am so blessed and have so much to be grateful for and fulfilled by. And there are days where I feel so dry, sad, unmotivated, desperate and invisible...these feelings co-exist with feelings of joy, love, pride, and gratitude. Some days are better than others and some are absolutely terrible and scary. It's always different. The bottom line is, for me, these thoughts and feelings are always there TOGETHER as a Yin and Yang in my own mind. Harmony and dissonence. Dark and light. You can't have one without the other. It is 30x48", acrylic, pencil and charcoal on gallery-wrapped canvas. It's gloss-varnished for protection and has hanging-hardware installed. I highly recommend a gold floater frame for this...it would be amazing! Now that my solo show of New England coastal paintings is hanging up, I've found my cravings to paint abstracts again have taken over. I'm not finished with landscapes forever; I just like to explore the other side of my creativity. I get such satisfaction from painting scenery I love and recognize; and then I get such a free feeling from painting in an imaginative way that speaks to my soul. My "Coastal Conversations" art show opening was a true excitement and I'm so thrilled my work is hanging in such a beautiful space! It was amazing to see my landscape paintings hanging all together; you can really see my artistic painting style throughout the work. I am all finished with my landscape cravings for now and plan to revisit them in the future after I explore my abstract cravings for a while! Visit 1200 Centre St. Boston (Roslindale), MA...The Hebrew Rehabilitation Center. Follow the signs to park by the visitors' entrance and the gallery is just inside and down the hall to the left. It will hang until August 3rd 2018; check it out while you can! Art is available for purchase in my art shop.